I’m a fiend for sticker motivation! I wonder if it comes from childhood, where excellent work garnered stickers on tests and gold stars for behaviour and whatnot. Whenever I do 30-day challenges (like yoga), I motivate myself with stickers. When I was a part-time university student a few summers ago, I used stickers to stay on top of things. My most important tool for productivity is a bullet journal. I’ve modified the original guidelines found on the bulletjournal.com to suit my needs I think it beats a traditional dated (or undated) planner because I can use it on the days when I need it. 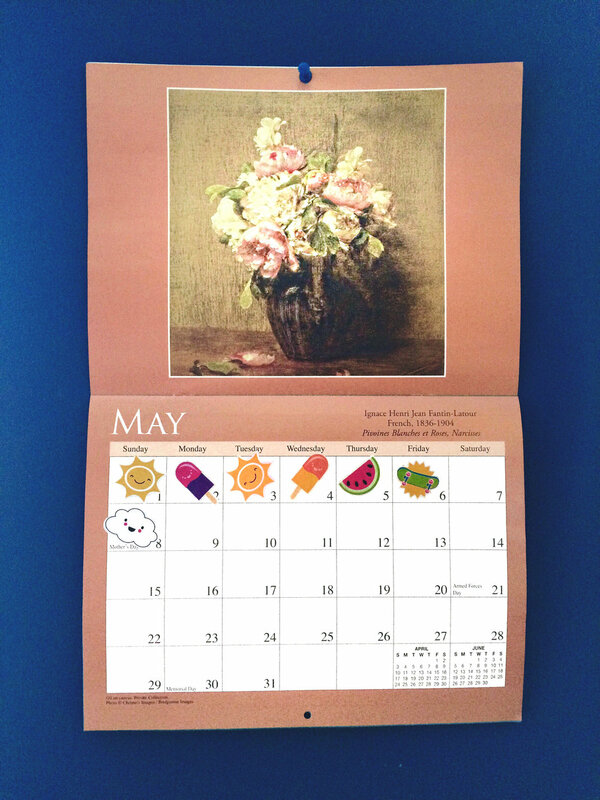 I didn’t use it yesterday, which means that there was no wasted or empty space for May 8 in my planner. The #WriteChain challenge on Writerology has been keeping my motivated this month, particularly with getting daily writing done. I’m thinking of modifying it, though, so it has a more tangible “chain”–maybe I’ll use stickers in a bullet journal habit tracker! I think you mentioned the bullet journal to me before! I’m definitely interested in trying that method out. I have so much going on in my life and I think it would help me stay on top of things. I definitely recommend stickers, though–they’re so much fun! I just started a bullet journal and I’m using it less for it’s actual purpose, and more for the daily habit tracker. It works best if you a) have something notable happen each day, and b) actually look at it *every* day. My middle of the work-week is busy so that for 3 days all I do is go to work, come home, then go back. So, nothing to note, and I don’t pick up the journal. But, when I do find time to write/read/go to yoga, I color in a square on my tracker — and stickers would work here, too! If I made my boxes bigger. But what’s great is, you’re making it yourself, so next month, I’m just going to draw bigger boxes. Win. Reward systems like this make me happy, generally speaking. They can be so encouraging! I personally I have never tried the sticker method (though I am now seriously tempted to) but I’ve recently (as in less than a week ago) become a little addicted to Habitica. There’s something about gaining experience for writing that I think will act as encouragement as I move forward. Are you familiar with it? That’s fair. I have it on the homescreen of the my phone, so I’m constantly seeing it, and I open it immediately on my laptop. So far it’s working for me, but I don’t have a ridiculously busy schedule at the moment so it may just be easier to keep track of it. How do you remind yourself to use the calendar? I find I forget to update the ones I have. It’s near my desk, which faces my bedroom door. As a result, it’s the first thing I see when I walk into the room. And now, I’ve been using the stickers for so long that it’s become a habit. I feel like I HAVE to keep the calendar updated!